Preface: The Istanbul Declaration on the protection of World Heritage (2016), also known as Istanbul Declaration, was adopted by the 40th session of the World Heritage Committee, UNESCO, Istanbul, Turkey, 11 July 2016. The World Heritage Committee establishes the sites which will be listed as UNESCO World Heritage Sites and examines the state of conservation of sites already on the list. The Committee comprises representatives from 21 State Parties elected by the General Assembly of State Parties to the Convention concerning the Protection of the World Cultural and Natural Heritage. 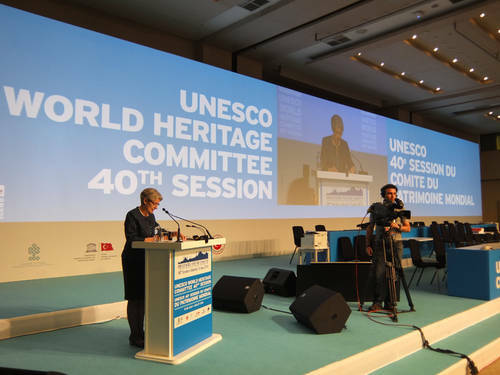 The 40th session of the World Heritage Committee opened in Istanbul (Turkey) under the chairmanship of Lale Ülker, Ambassador, Director General of Cultural Affairs and Promotion Abroad of the Turkish Ministry of Foreign Affairs. The opening ceremony was an opportunity to stress that World Heritage, which is now, more than ever, the subject of numerous threats, must remain a vector of cohesion and dialogue at the international level. The Committee convened from 10-17 July 2016, in Istanbul, Turkey. The Committee adjourned three days ahead of schedule as a result of the events in Turkey; the Committee will resume its 40th session in Paris, France, in October 2016. 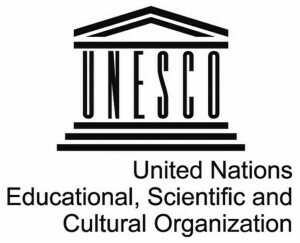 UNESCO Director-General Irina Bokova said World Heritage embodies a revolutionary idea, “the idea that people of all cultures and faith can unite around outstanding universal value. When a World Heritage site is destroyed anywhere in the world, we all suffer, we are all diminished, even if it is from another region, another period, another culture,” she said. “What is at stake here is more than adding new sites on a list. It is about reaffirming human values and human rights. It is about healing wounded memories, harnessing heritage to regain confidence, to recover and look into the future,” the Director-General added. Turkish Culture Minister Nabi Avcı meanwhile insisted on the fact that UNESCO is best placed to promote cooperation. “UNESCO is the banner-holder of soft power, a fundamental principle upon which peace can be built,” he said. “In this regard, I strongly believe it is our duty to strengthen the role of UNESCO in the protection of heritage in conflict areas and to ensure the protection and preservation of sites in areas affected by natural disaster,” said Ambassador Michael Worbs, Chairperson of the Executive Board of UNESCO. Many celebrities, including Kadir Topbaş, Mayor of Istanbul or Öcal Oğuz, President of the Turkish National Commission for UNESCO, took part in this ceremony attended by some 800 participants. During this session, the World Heritage Committee considered the nominations of 27 sites on the List of UNESCO World Heritage. These include nine new natural sites, 14 cultural sites and four mixed sites (i.e. both natural and cultural). The Committee also reviewed the state of conservation of 108 sites already on the List and 48 sites on the List of World Heritage in Danger at its session. 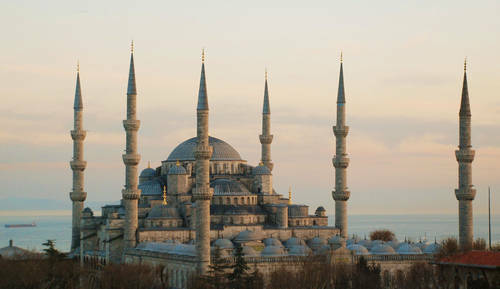 The 40th session of the World Heritage Committee adopted the Istanbul Declaration on the Protection of World Heritage, which invites States Parties to take measures and act together against the destruction of common heritage of humankind in cooperation with the UN Educational, Scientific and Cultural Organization (UNESCO). Participants also added 12 sites of special cultural or physical significance to the World Heritage List. In the Declaration, the World Heritage Committee invites States Parties to consider innovative and effective solutions to address evolving needs in heritage preservation, and calls upon them to integrate the protection of cultural and natural heritage in their policy making processes and security strategies. It further calls on States Parties to exercise proactive policy supported by initiatives to protect and restore cultural and natural heritage sites, especially those on the List of World Heritage in Danger. The Declaration strongly encourages all States Parties to make financial contributions. one of the world’s largest inland delta systems, in Iraq; a transnational site in Kazakhstan, Kyrgyzstan and Uzbekistan that encompasses one of the largest mountain ranges in the world, the Western Tien-Shan; and one of the largest ensembles of rock art in the Sahara, in a sandstone area of Chad. Another newly protected site is Hubei Shennongjia, which protects the largest primary forest in central China and provides habitats for rare animal species like the Clouded and Common Leopard, the Asian Black Bar and the Golden or Snub-nosed Monkey. Other sites include: the Khangchendzonga National Park in northern India, which contains a diversity of forests, glaciers, lakes, mountains and valleys and the world’s third-highest peak, Mount Khangchendzonga; and an archipelago site in Mexico that protects part of a submerged mountain range, which is of particular importance for seabirds as well as other wildlife, such as dolphins, manta rays, sharks and whales. Another marine site was added in Sudan: the Sanganeb Marine National Park and Dungonab Bay-Mukkawar Island Marine National Park, which will protect an isolated coral reef structure in the central Red Sea and an offshore atoll. The area also hosts coral reefs, mangroves, seagrass beds and other coastal and marine features that are home to fish, marine mammals and fish, including a globally significant population of dugongs. The Committee decided to remove Georgia’s Historical Monuments of Mtskheta from the List of World Heritage in Danger, which has been on the list since 2009 due to uncontrolled urban sprawl and the deterioration of the three medieval churches’ stone fabric and fresco paintings. The decision recognizes Georgia’s efforts to improve the site’s management and safeguarding. The Committee placed several other sites on the List of World Heritage in Danger list, including five sites in Libya, noting that the high level of instability in the country has already resulted in damage. The World Heritage List includes over 1,000 properties. The Committee also reviewed the proposed amendments of the Operational Guidelines, which results in the WHC-16/40.COM/11, WHC-16/40.COM/13A, and the Operational Guidelines for the Implementation of the World Heritage Convention (2016), which was adopted by the 40th session of the World Heritage Committee, UNESCO Headquarters, Paris, France, 24-26 October 2016. The 40th session of the World Heritage Committee, UNESCO, Istanbul, Turkey, 10-20 July 2016. The Istanbul Declaration invites States Parties to take measures and act together against the destruction of common heritage of humankind in cooperation with the UN Educational, Scientific and Cultural Organization (UNESCO). The Istanbul Declaration invites States Parties to consider innovative and effective solutions to address evolving needs in heritage preservation, and calls upon them to integrate the protection of cultural and natural heritage in their policy making processes and security strategies. The Istanbul Declaration further calls on States Parties to exercise proactive policy supported by initiatives to protect and restore cultural and natural heritage sites, especially those on the List of World Heritage in Danger. The Istanbul Declaration strongly encourages all States Parties to make financial contributions.